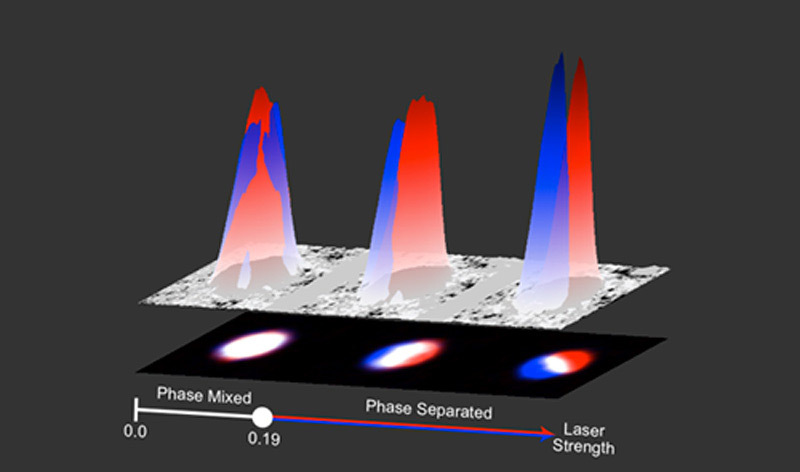 PFC-supported researchers, lead by Ian Spielman, recently demonstrated for the first time spin-orbit coupling in Bose-Einstein condensates (BECs), where the neutral atoms exhibited properties similar to electrons in material systems. The scientists engineered a laser-atom interaction whose energetic description of the system or Hamilitonian is analogous to electrons moving in specific semiconducting materials such as gallium arsenide (used as amplifiers in cell phones). The starting point for these experiments were BECs consisting of a few hundred thousand rubidium atoms in an atom trap, at temperatures around 70 billionths of a degree above absolute zero. This atomic system can be thought of as having two energy levels that are labeled “spin-up” and “spin-down” (red and blue in the diagram). To generate spin-orbit coupling the scientists prepared the atoms in a combination of the two spin states. Then the twist: a pair of laser beams created a moving pattern of light traveling across the BEC. Atoms occupying the different spin states interact with the light wave and a new energy level structure emerges that couples these spin states to their motion. The scientists verified that the spins were coupled to the motion by inspecting the atoms’ velocity and spin after releasing them from the atom trap.